All gelato is not made equal. Its hard to tell until that first lick - when it desolves and leaves a sweet silky smooth taste in your mouth. You can feel the love when it's real. 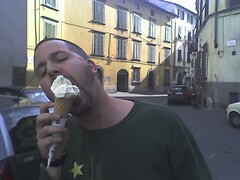 Today I met my new favorite - pine nut ice cream. I'm still feelin the love. In fact, we're both feeling a lot of love in Italy. Florence, Rome, Siena, San Gimignano, Lucca and tomorrow Cinque Terre - its all so amazingly rich. Culture, art, food, architecture, people, cars, colors, smells - the Italians do it differently and we like it - a lot. Unfortunately we haven't made time for uploading pics and videos, but they are coming soon. Until then, enjoy Halloween and remember to vote in a week (if your in the US)! We totally dropped the ball for absentee ballots.